You might object, as you did in high school, that you can’t perform while wearing protection. Hunting is especially difficult with a handicapped sense of hearing, and you don’t want to let that trophy buck sneak past the tree stand. Those excuses may have worked in the past, as any old-timer will tell you (loudly), but these days electronic earbuds allow hunters and shooters to protect their hearing while maintaining their situational awareness. Walker’s new Silencer Bluetooth electronic earbuds come with a Noise Reduction Rating (NRR) of 26dB and feature hearing enhancement, Bluetooth compatibility, rechargeable batteries, and customizable sizing fins. 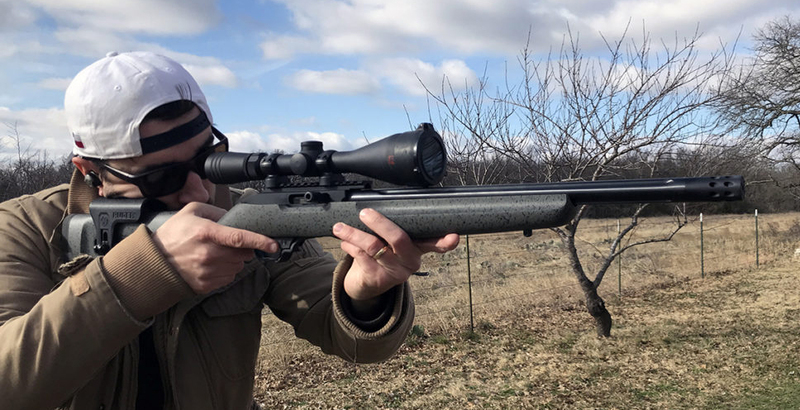 I’ve taken them hog hunting, deer hunting, pistol shooting, and rifle shooting, and while I wouldn’t call them perfect, they’re a great option for those who want to effectively protect their hearing without affecting performance. The earbuds come with a carrying case that doubles as a recharging station. Smart people tell me that measuring noise is more complicated than whipping out a decibel meter. That’s why most manufacturers of hearing protection products include a Noise Reduction Rating (NRR) that provides a consistent yardstick to compare the potential protection of different devices. The maximum NRR rating for earplugs is 33dB, and the max rating for earmuffs is 31dB. The Silencer Bluetooth earbuds have an NRR rating of 26dB using the Sure-Lock sizing fins and automatic high volume suppression. The Silencers automatically suppress loud sounds, both transient and sustained, limiting the maximum possible output level to between 97dB and 103dB, depending on the hearing mode (more on that below). Three different sizes of fins and buds allow users to maximize hearing protection. The Silencers’ NRR rating can compete with everything currently on the market, and my experience doesn’t give me any reason to doubt it. I usually prefer earbuds to earmuffs, especially while shooting a rifle. But passive (as opposed to electronic) earbuds sometimes leave me with a headache after a day at the range. The Silencer earbuds worked flawlessly in this regard. I used them while shooting pistols, rifles, and shotguns and never experienced any noise-related discomfort even after 3+-hour range sessions. I didn’t experience any discomfort even when shooting bolt action and semi-automatic rifles. The Silencer earbuds excel at their most basic task, but you don’t pay $200 for earbuds that just protect your hearing. 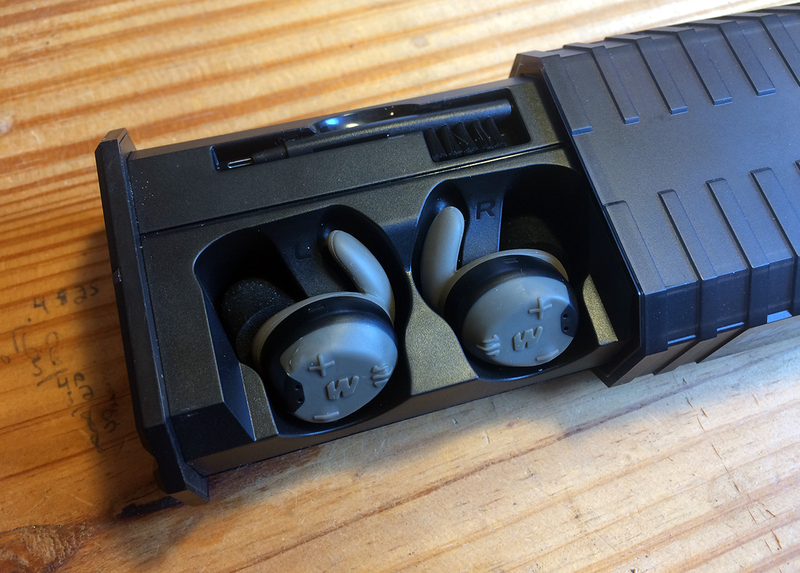 The Bluetooth Silencer earbuds also enhance the user’s hearing, which is an especially useful feature for hunters. Users control the volume with “+” and “–“ buttons on each earbud or with a sliding control on the free Walker’s phone app. The Silencer earbuds also have four “Environmental Hearing Modes,” two of which boost incoming sounds: “High-Frequency Boost” increases sound for frequencies above 1kHz, and “Power Boost” increases volume twice as high as normal levels. The volume can be controlled using buttons on each earbud or on the mobile app. I took the Silencer earbuds hunting on several occasions this year, and the sound boost modes worked precisely as advertised. The earbuds do generate the slightest bit of background fuzz, however, especially with the volume turned up. While the Silencers allowed me to hear every squirrel and bird rustling the leaves, it takes time to learn to ignore the fuzz and concentrate on outside noises. I didn’t have the same problem at the range. One of the other Environmental Modes—called “Clear Voice”—eliminated the fuzz and allowed for crystal-clear conversations. If you aren’t concerned about enhancing your hearing, Clear Voice would solve the background fuzz problem in the field. Two final notes on performance. 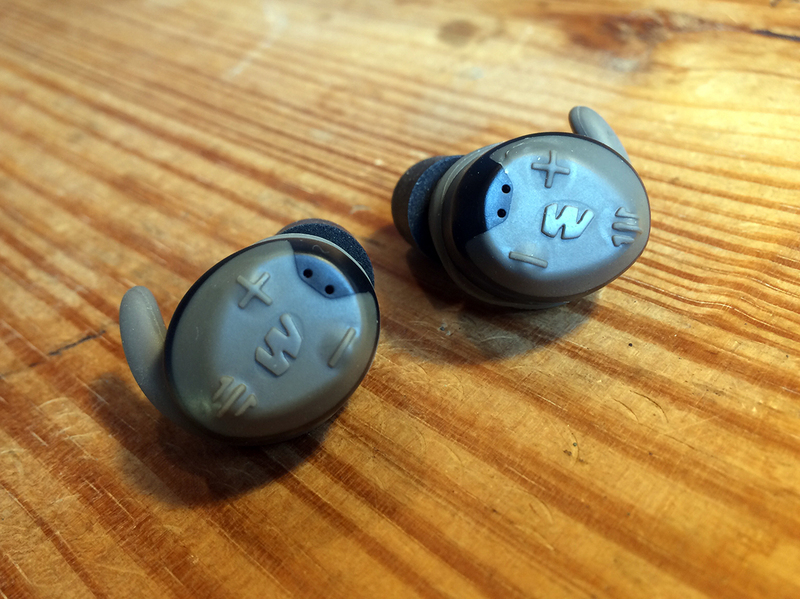 The earbuds feature “Dynamic Wind Noise Reduction,” according to Walker’s, but that doesn’t stop strong winds from creating a hissing sound when they hit the earbuds just right. It’s not a deal-breaker, but I’ve used electronic earmuffs that do a better job controlling wind interference. Also, the earbuds are “weatherproof” but not “waterproof,” according to Walker’s. They’ll be fine if it starts to rain while on a hunt (provided they’ve dried out afterward), but they’ll likely have issues if they’re fully submerged. These earbuds are packed with features, so I’ll just touch on a few. The Silencers come with three sizes of foam ear inserts and three sizes of “fins.” You can mix and match the inserts with the fins to find the combination that provides the best comfort and hearing protection. I found the medium-sized inserts and fins to be the most comfortable, and I didn’t notice any difference in sound suppression among all three sizes of both components. On a normal two or three-hour range trip, I don’t notice I’m wearing them. But after a full afternoon, I usually start to feel some discomfort. I have oddly-shaped ears, though (I’ve never been able to use Apple earbuds), so you might find the Silencers to be comfortable no matter how long you wear them. What separates these Silencers from previous models is their ability to connect with a mobile device via Bluetooth. This capability allows the user to control volume level, hearing mode, and auto shut-off via a mobile app. It also allows for listening to music or podcasts and calling through your mobile device. I listen to podcasts almost every evening while walking our dogs. I’ve loved using the Silencers because I can hear my surroundings through a single earbud while I also listen to podcasts or music. I’ve also used this feature to pass the time in a deer blind in the dark hours before the deer begin to arrive. Finally, the Silencers come with a recharging station that doubles as a carrying case. 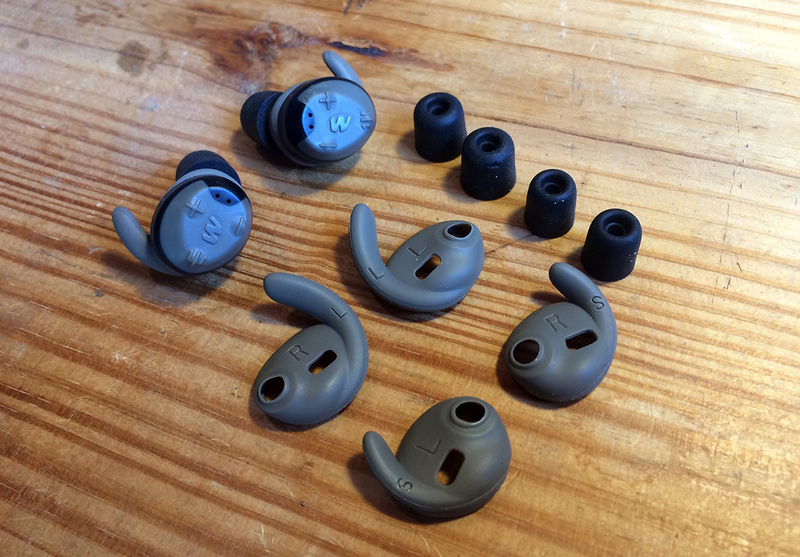 Users simply slip each earbud in the slots, and they snap in place via a set of magnets. According to the manual, users can expect 14 hours of battery life during general use and 4 hours while Bluetooth streaming. The charging case can charge the earbud 6 times before it needs to be plugged in again. The carrying case charges both earbuds automatically, provided they’ve both been powered on and off. The recharging case solves two problems. 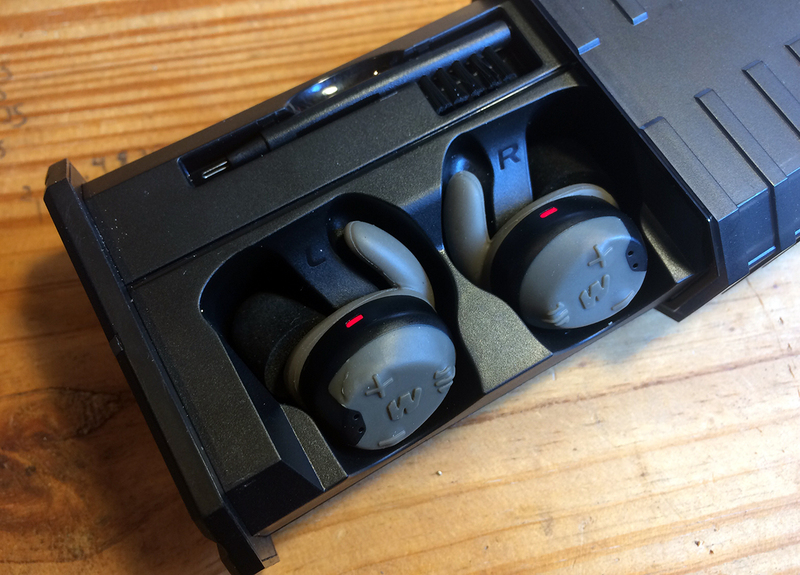 It provides a power source in case the earbuds run out of power in the field or at the range, and it’s a handy place to store the buds securely. I didn’t experience any significant issues, though I did find that the case will only charge the earbuds if both buds have been powered on and off. When I tried to use the left earbud to listen to music, it wouldn’t charge until I turned on the right earbud as well. 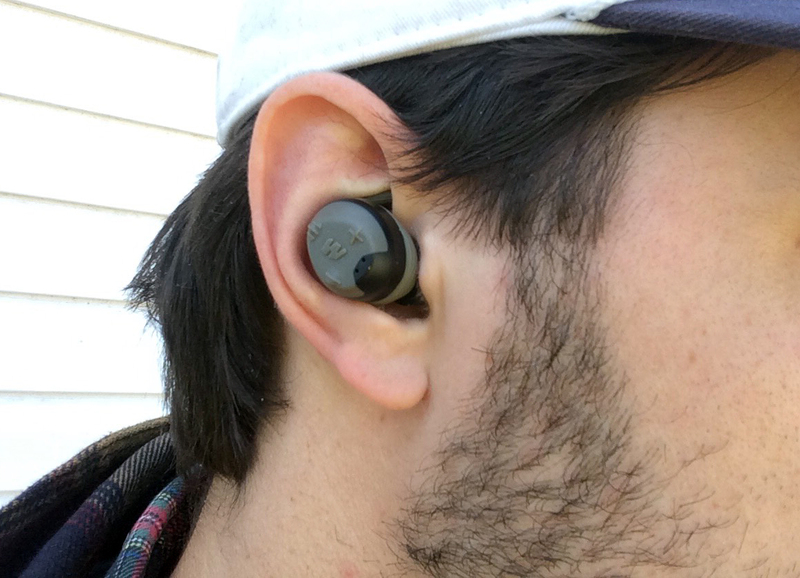 The Silencer Bluetooth electronic earbuds from Walker’s are a great advancement on an already stellar product. 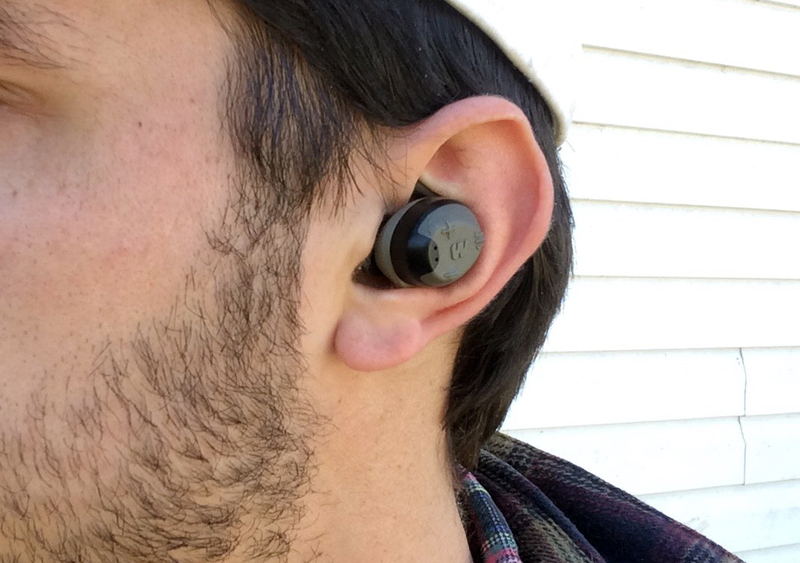 They function well in the field or at the range, but they also double as general-purpose earbuds for listening to music or using power tools and lawn equipment. The audio quality is good, and they’re loaded with features. In short, if you’re looking for 21st-century hearing protection without the custom-fit price tag, the Silencer earbuds are worth a look. For more information visit Walker’s! website. Is there any type of cord or safety retainer should one bud come out? Your review should have specifically included your testing results regarding battery life. Comments on product website mention less than specified battery life. Also your “real world” $199 price is for the NON-blue tooth model. Longevity of non-replaceable batteries should also be tested. If you regularly use them for a year how’s the charge life and what happens when batteries no longer hold a charge – does company replace for fee or free OR you’re SOL and need to re-purchase. These are some very good questions!